As an aside from painting and learning a new ruleset, I thought I would try to learn a little more about the Prussians. I have also been going through the lead pile and the biscuit tin that holds the Prussians is particularly heavy. I have already painted 11 battalions and am on my 12th of infantry, 11 squadrons of cavalry and 6 artillery stands as well as lots of command pieces. So well on my way. I am particularly interested in the 1815 period, but really it is easy to extend my units back to the 1813 period, just a bit of a change in the brigade structure. 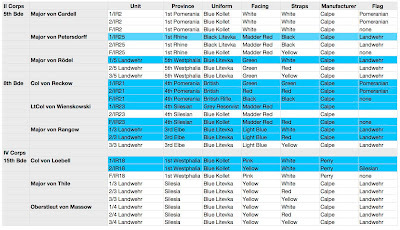 I like to paint coherent historical units, and decided to try do this at the brigade level (divisional) rather the corps level. I already had some units painted from my Walmoden project, so I that somewhat effected my subsequent choices. I like a variety of figures and the brigades I have selected support this. When looking at the 1815 OB, the units that stick out are the black coated IR25, the grey reserve coated IR 23 and the British uniformed IR 21. I could have also gone with the Russian uniformed IR30/31, as well as the white coated IR28/29, but as usual I have to control myself. I am also quite interested in the Battle for Placenoit, so that affected my choice. Having had a careful study of what I have done, I decided to eventually plan of three brigades, that is 27 infantry battalions so is still quite a lot of work....... a long term project shall we say. I did feel better though with a clear vision of the future! The highlighted units are done, still lots to do, but it fits with what I have on hand, I believe this will exhaust the lead pile with the only extra figures another unit of Lutzow's Freicorp (2/IR25). I am getting all done with plastics I like the Perry plastics, although I will probably never paint another Victrix figure again. But even with the Perry's I am snapping off bayonets, I am rough with the figures, and they are always getting loaded on planes or cars for trips. 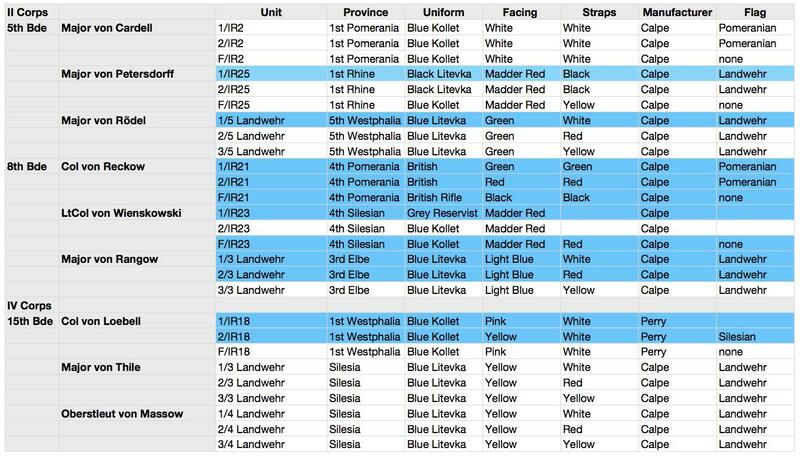 The only bit to which I may have some resistance, is the 6 battalions of Silesian Landwehr, may get bored there, who knows maybe I will substitute in some of those sky blue faced Berg. So that was the easy part, next up was how to organize the command structure, clearly a Prussian brigade is similar to a division in other armies. That is not to difficult as most of my games feature 1-2 divisions aside, but the number of sub commanders to assign to each brigade (division) gave me some pause for thought. Using a sub commander for each 3 regiments from a gaming perspective seemed a little excessive; 3 battalions is a small subcommand, even if I attach a battery of artillery or a couple of squadrons of horse. What to do, what to do? Well the Miniatures Page is always an interesting adventure so I said why not post my enquiry there. You really can get some excellent advice there, but at the same time you really have to be ready for those who really want to see their knowledge (biases) in print. I really got quite a lot of responses and two posters were really quite helpful. Of course, Stephen Summerfield is all things Prussian (I have all his books) and I found Michael Collins very helpful. Michael has his own ruleset called Grand Manoevre, look at his website very impressive. Anyway the message string was quite interesting and I got the information I wanted in order to make a decision, I also learned quite a lot as well. Both the 1813 and 1815 Prussian brigades were mixed arms tactical units which really were made up on an ad hoc basis as needed for the tactical situation. So for wargaming purposes, I felt I would go with the nine battalion infantry brigade with an attached artillery battery and 2-3 cavalry squadrons. I really liked the following tactical formation that I found with the Fusilers out front with Jaegers with the musketeers in a second line and the Landwehr regiment in reserve in a third line. I have over drawn the red lines, looks impressive does it not. Usually from what I understand the foot artillery would be in the front line with horse artillery and cavalry in the rear. I plan to use 2 sub-commanders with the Brigade Commander. Probably with the reserve and horse under the direct command of the Brigadier. I have my Prussians stored away, otherwise I would have put out a brigade on the table and made some photographs, I am looking forward to seeing them on the table. Well back to learning a new set of rules. I'm also doing the 1815 Prussians but mine are the more manageable 6mm type. Very interesting John. I had about the same questioning with sub-commanders in a Prussian Brigade. The answer you give seems fairly balanced considering the brigade organisation in other nations. Especially France. I really look forward to our next meeting mon ami. Always helps to have a plan! That is quite a large force, especially once you ad the supporting artillery and cavalry!